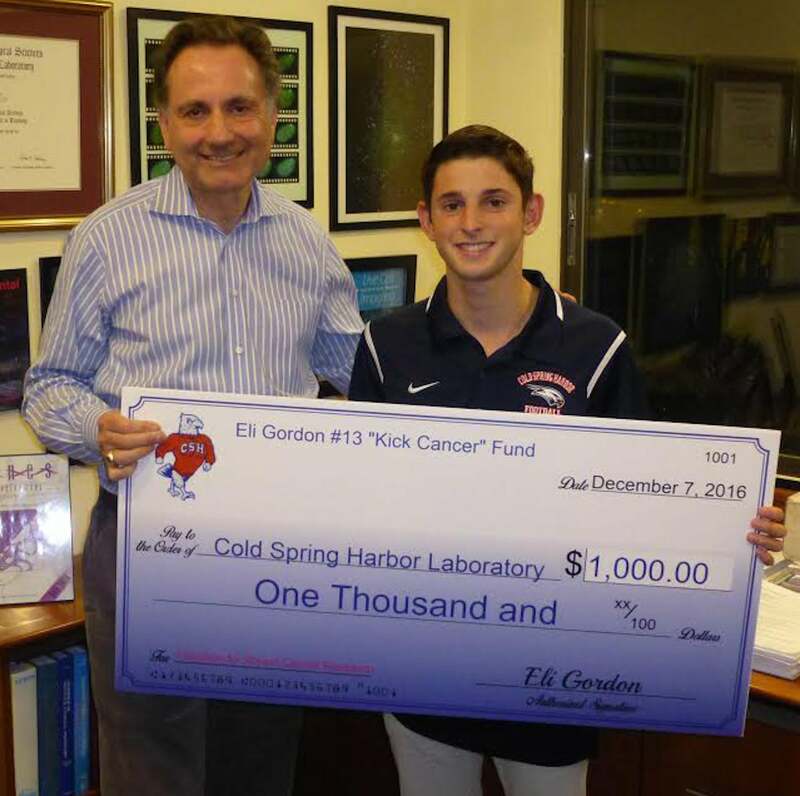 Eli Gordon, kicker for the Cold Spring Harbor Seahawks Varsity Football Team, presented a check today for $1,000.00 for breast cancer research, as part of his “Kick Cancer” fundraising initiative, to Dr. David Spector, Director of Research and Professor at Cold Spring Harbor Labs. Gordon pledged $25 for every extra point he made this season; with matching funds and other supporters the total contribution came to $1,000.00. Eli Gordon presents a check to Dr. David Spector to support his breast cancer research. Gordon came up with the idea for his “Kick Cancer” fund after participating earlier this year in the Carolina Panthers’ “Keep Pounding” 5K in Charlotte to raise money for cancer research through the Carolinas Healthcare Foundation. Gordon wanted to bring the cause closer to home and coordinated his efforts through Cold Spring Harbor Labs in light of their world-renowned cancer research facilities. 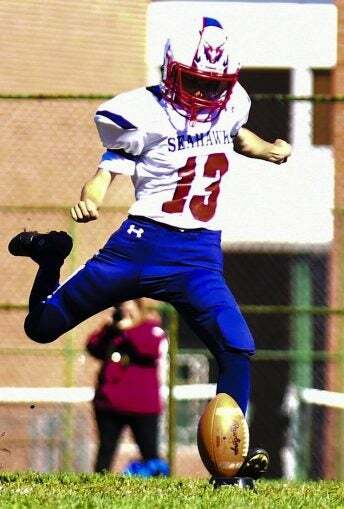 He is also making this year’s donation in memory of former Cold Spring Harbor High School teacher Victoria Terenzi who passed away earlier this year from breast cancer. Gordon was also inspired to make a difference by the legacy of former NFL All-Pro linebacker Sam Mills Jr., who as a coach for the Carolina Panthers gave a memorable speech before their NFC playoff game in 2004 when he was diagnosed with cancer. He told the team he could either give in to the disease or “keep pounding”, and he was going to keep pounding and they should too. It continues to be the philosophy of the Panthers to this day and is a way of life for Eli. Keep pounding, never give up! Gordon, a junior, is also a member of the Cold Spring Harbor Varsity Soccer Team, President of Save the Children, and a member of Natural Helpers. He was awarded the distinction of being named a NYS Scholar Athlete for the fall of 2016. Gordon hopes to improve his performance next year and raise even more money for this worthwhile cause. Cancer research at Cold Spring Harbor Labs is devoted to understanding the fundamental biology of human cancer, with the ultimate goal of developing new cancer therapies and diagnostic tests. A broad range of cancer types are under study, including breast, prostate, leukemia, glioma, pancreatic, sarcoma, lung and melanoma. CSHL has been a National Cancer Institute (NCI) designated Cancer Center since 1987.